Quilt Dad: Wonky September | Quilt along with me! Wonky September | Quilt along with me! Have you guys ever visited Dana at the Old Red Barn Company? 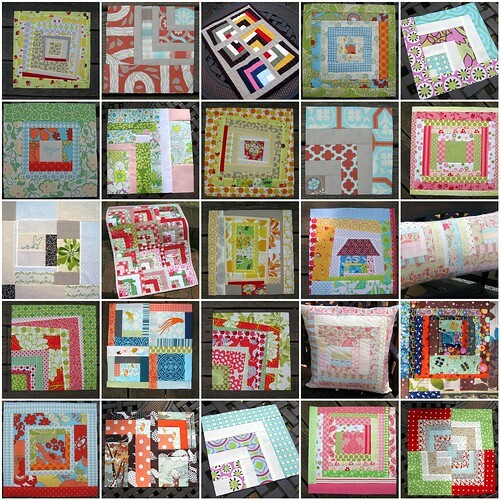 Besides being a super cool chick, she has started a quilt-along group over in Flickr that has gained quite a following. 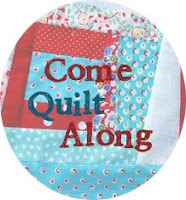 You can see all of Dana's quilt along posts compiled here. Well, when Dana's quilt-along was over, the group wouldn't just let her walk away. Oh no. They demanded a second quilt-along. Amy (aka Park City Girl) stepped up and offered to lead a zig-zag quilt along. In typical Amy style, she did a wonderful job leading the group through the creation of even more beautiful quilts. Want to make a zig-zag quilt of your own? Check out Amy's easy-to-follow instructions here. Well, let me tell you ... the group has taken on a life of its own. Its members are hungry ... no, VORACIOUS ... for more, mOrE, MORE QUILTS! So when round 2 ended, they did not go quietly. They demanded another quilt along. They screamed for another leader. They begged for a wonky log cabin quilt instructions. And then Dana nominated ... me. And I accepted the challenge. So, I hereby declare next month WONKY SEPTEMBER! Starting tomorrow (September 1st), I will be posting a series of tutorials over the coming weeks on making your own wonky log cabin quilt. This is by no means my own personal pattern -- I can hardly take credit for the wonky log cabin block! -- but I hope I can inspire some people to try something new by helping them to take it one step at a time, sharing some of my tips and tricks along the way. Won't you quilt along with me? If you're interested, all you need are a bunch of fat quarters (around 16 or so ... or the equivalent in yardage cuts). It could be a great stash-buster, and also a great holiday gift idea. Be sure to also join the Flickr group. Here's the link. I want to see it all -- from your fabric selections to your progress to your final quilts. I've not tried log cabins yet let alone wonky ones. Sounds fun! ooh you have me intrigued... I might just be following along! Oooo that sound mighty tempting. Maybe a Christmas themed one for our lounge? Looking forward to following along. Cannot wait!!! And your description of our Flickr group is absolutely hilarious! And true. LOL! I missed round 2, but I think I could get on the bandwagon for 3! Thanks for stepping up! YAY! Lead on my friend and we will follow. Thanks for taking this on! Oh, we are sooo gonna ROCK this WONK! I'm in -- and can't wait to get started! I just might have to join you all on this one. I have been wanting to try and get a little wonky lately. Fabulous - I was hoping to join a quilt-along, and here it is! YAY! Eeeeekkk!! So excited! Just can't wait till tomorrow! I have too much else on the go to join right now, unfortunately, but I must ask . . . does this mean you will actually have to finish the quilt? Like quilt it and bind it and stuff? So you might actually have a quilt made by you in your house? Hope so. Can't wait to see the finished product! you know i'm in.. just may be slow going at first with how much i have on my plate! super excited!!! Can't wait to get started, going to start picking out fabrics right now! I am ready and waiting, I was going to use fabric from my stash but I had to go to the store and pick up thread to quilt my zig zag quilt and I just had to pick up 27 fat quarters so I might use those.. you know it is impossible to go to the store and not buy fabric and just get thread. So lets all get ready , get set and go!!!!! not like i don't have enough to do already... :) i just might follow along with you guys this time. i love log cabins and i can do those wonky without too much thought (i like patterns and structure). Thanks for hosting....I love the floating wonky log cabin. I must try thanks!! I'm in. I don't know if I can finish a whole quilt by the end of this month, but I will be excited to work on some blocks and hone my wonky skills! Thanks for hosting!